Shea went to the groomers today. 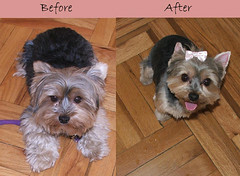 Lots of people like to have their Yorkies with long hair, I like to keep it short. My favorite is when her hair gets in between these two pictures, not as long but not as short. I was so excited when I picked her up today...she usually puts bandanas on her but she said she ran out so she put in this clip. Her first clip, I love it! I've been planning on making a new item for JT Stitches after the holidays--but now that my baby has short hair I might have to start ASAP! I have a lot of projects to get done before Christmas. I have so many ideas floating around in my head one being a quilt I'm going to make for my grandmother. I've never made a quilt before so I decided to make a "practice" quilt for my big dog Lexi. I really wish I started earlier on Christmas gifts but I'm so last minute I'll probably be up December 24th sewing my little heart out.